The history behind Goebel’s M.I. Hummel figurines is short, and well-known by most porcelain collectors; Franz Goebel, of W. Goebel Porzellanfabrik, saw Sister Maria Innocentia Hummel’s artwork on a series of postcards, and recognized an opportunity. Goebel quickly signed an agreement to produce porcelain figurines based on her artwork, and introduced the first M.I. Hummel figurines in 1935. And the rest – is porcelain collector’s history. But what isn’t as well known is that what really gave M.I. Hummel figurines their start was the American G.I. and his base PX. (General Store). *Note: The M.I. Hummel signature was stamped or incised on all pieces that were large enough to accommodate it, but for pieces that couldn’t – only the Goebel mark was used. *Experienced Goebel M.I. Hummel collectors have noted that it is not unusual to find slight variations of these authentic trademarks. American G.I.’s stationed in Germany saw those cute porcelain figurines as the perfect souvenirs to send back home to moms and girlfriends. Their popularity with the soldiers soon had the American base PX system carrying them as regular inventory. And America became Goebel’s largest market for Hummel porcelain figurines. The absence of this signature is common because of the small base area of most Hummel figurines.But authentic Hummels will always have one of the Goebel TMK marks on the bottom of the figurine. You can use this link to see the actual Hummel pieces currently being offered. These marks were used on all Goebel porcelain pieces, not just Hummel. When the size of the figurine base allowed – the M.I. Hummel backstamp was included with these marks. *The mark is sometimes found in an incised circle. 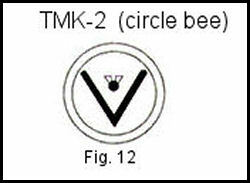 There were 12 variations of the Bee mark, either incised, backstamped, or a combination, (see Fig.12),and in blue or black, underglazed and overglazed. Fig.13 is known as the large stylized bee – used primarily from 1960 through 1963. The “W. Germany” is placed to the right of the bottom of the “V”. The mark can be black or blue. Sometimes found in an incised circle. Fig.14, the small stylized bee was used concurrently with the large stylized bee from about 1960, and continued after 1963 until about 1972. The mark is usually in blue. It is also referred to as the One Line Mark. This Hummel mark is often referred to as the “3-line” or “3LM” mark, and was always* backstamped in blue. *”Always” is a dangerous word – both Goebel and experienced collectors admit the possibility of a “black” TMK-4. Developed and occasionally used as early as 1970, this major change is known by some collectors as the Last Bee mark because the next change in the trademark no longer incorporated any form of the V and the bee. The mark was used until about mid-1979, when they began to phase it out, completing the transition to the new trademark in 1980. Generally the mark was placed under the glaze from 1972-1976 and over the glaze 1976-1979. Use of this trademark began in 1979. 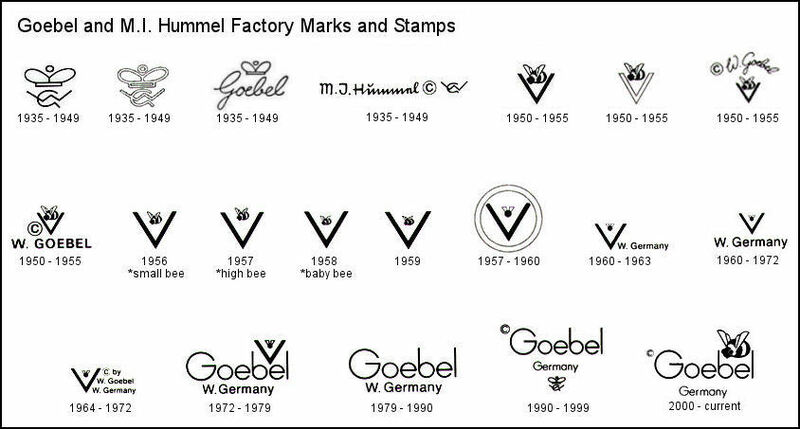 Goebel removed the V and bee from the mark altogether, which prompted the nickname; “the missing bee.” Along with this change, the company also began adding to the traditional artist’s mark with the date the artist finished painting the piece. But as with unpainted white overglaze pieces, it is not unusual to find Hummel pieces of this period with the date omitted. In 1991 Goebel historically changed the trademark again. 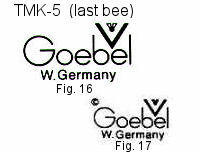 Until that year, the same trademark was on virtually all Goebel products, but this Hummel mark, TMK-7, is for exclusive use on products made from the paintings and drawings of M.I. Hummel. 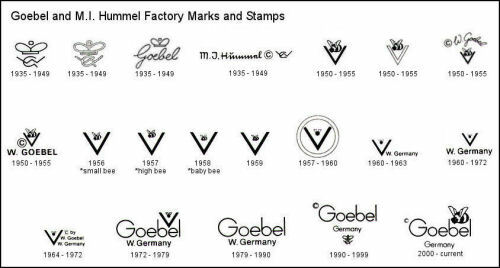 **Other Goebel products will bear a different mark than that used on Hummel pieces. In 1999 collector feedback prompted Goebel to bring back the Bee! The new Goebel Hummel “Bee” mark, combining the iconic Hummel Bee and Goebel’s own mark debuted in 2000. Sister MI Hummel left behind a collection of her drawings for the continuation of the Hummel figurine line, and her convent, the Convent of Siessen, appointed an Artistic Board, that had to approve all of the clay models and painted figures before Goebels could begin production of any new Hummel figurines. 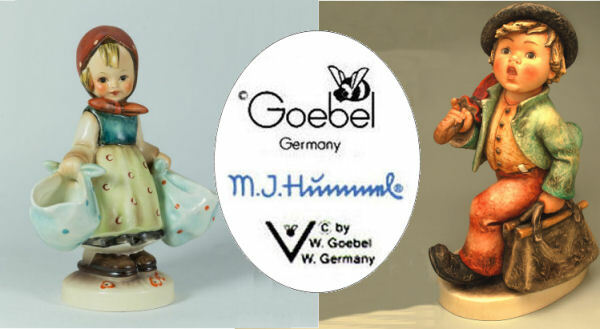 Goebels officially ceased production of authentic Goebel Hummel figurines in 2008. Another expansion of the Goebel Hummel line was the introduction of Hummel plates. 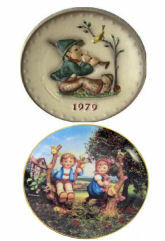 Issued both in series and annual special issue pieces, Hummel plates quickly caught on with collectors and have become an integral part of many Hummel collections. These “raised-relief” ceramics can be authenticated by makers markings similar to the ones used on the Hummel figurines. 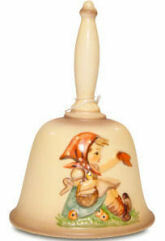 Goebel Hummel Bells are another segment of Goebel Porcelain collectibles in the Hummel line, and like the plates, are issued in series and annual pieces. See Goebel/M.I. Hummel German Porcelain pieces for sale Now!